Use each side and the centre for three separate baths (each piece is big enough to stand on its own), or sink in with the whole thing all at once for the most luxurious soak imaginable. Sodium Bicarbonate, Citric Acid, Perfume, Jasmine Absolute, Fair Trade Vanilla Absolute, Neroli Oil,*Eugenol,*Limonene,*Linalool, Geraniol, Methyl Ionone, Gardenia Extract, Colour 45410, Colour 17200, Colour 14700, Pink Lustre, Yellow Lustre, Red Edible Hearts, Pink Heart Confetti. I found that the best way to use these is the break them in a bag using a rolling pin. that way you can share the contents evenly. I got three baths from mine and the bath water was a lovely clear pink colour. It smelled pleasantly sweet and floral. The water was silky soft and allowed me to relax and enjoy in luxury. It doesn't clean so i did use shower gel or soap to clean my self. 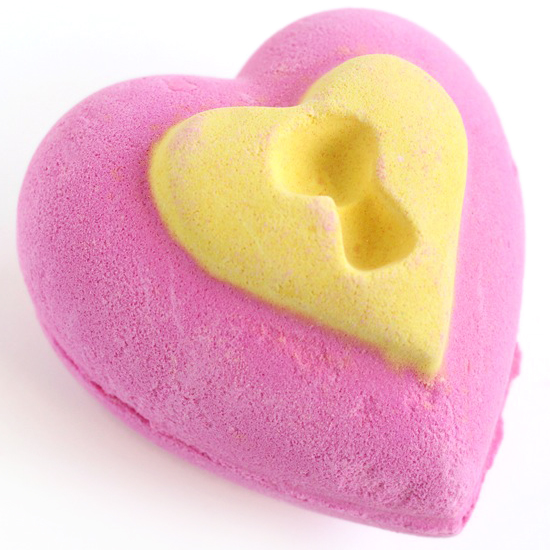 A lovely heart shaped bath bomb released for valentine's Day 2014 leaves the bath water a lovely pink colour. - A sizeable bath bomb. - A lovely floral fragrance. 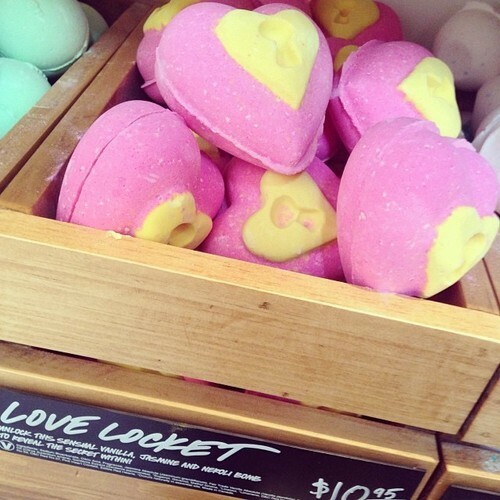 - Can be used for up to 3 baths (the locket can be broken into two halves and there's a small pink heart in the centre). - Turns the water a pretty pink colour. - Leaves the skin feeling soft. - A bit difficult to break open without making a mess. - The red hearts in the small pink heart are so tiny that you can barely see them. A good-sized bath bomb with a lovely floral fragrance. "I found that the best way to use these is the break them in a bag using a rolling pin. that way you can share..."